The Porirua Moore Wilson's Sushi kiosk is a 2017 build, combining analog craft with digital fabrication. 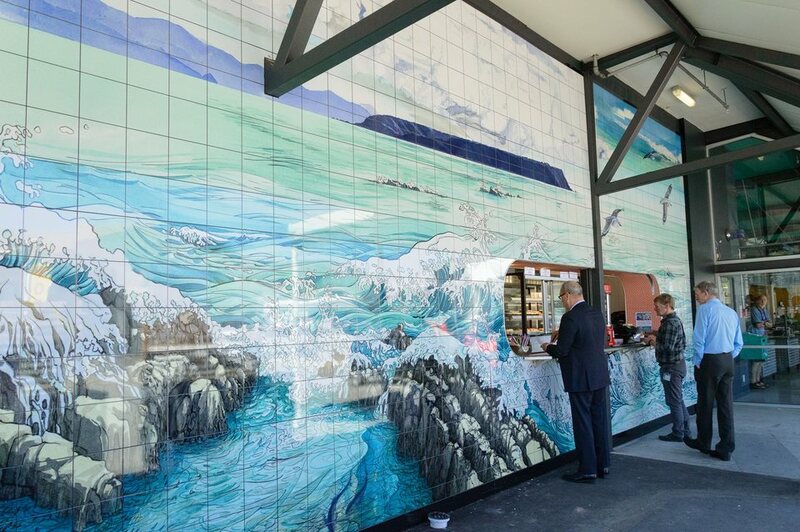 A Japanese style painting of Mana Island by our art director Sue Dorrington, provides a stunning façade for the hole-in-the-wall food kiosk. Artist Sue Dorrington describes the work as being like a visual opera. " I wanted it to be relevant to Porirua as well as a reference to Japanese style brush work. Distant and expansive views coupled with intermittent rock pools create a sense of travel and changes of mood." The wall appears to be covered with handprinted tiles; However a lot of modern day technology has gone into the effective treatment. CNC routers engraved imitation tile grouting into sheets of Aluminium Composite Material (ACM), commonly used for outdoor signage and cladding. Ink Digital also provided the large scale printing capability on the ACM facade required to bring the mural to life. Miramar's Human Dynamo Workshop were also the creative force behind Moore Wilson's Tory Street Chook Wagon, a replica of the iconic 1947 Citroen H series light truck, and Porirua's nautical Wine, Beer & Spirits Store. O'Sushi is run by Miki Wee, owner of Newtown’s popular O’Sushi. Miki is an experienced sushi maker and uses only the best, freshest ingredients in her sushi, made onsite daily. Moore Wilson's has been a Wellington institution for nearly 100 years.